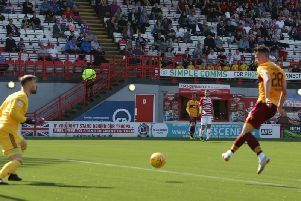 Motherwell ace Alex Rodriguez-Gorrin is thrilled by the sensational impact of his youthful midfield mates David Turnbull, Allan Campbell and Jake Hastie, writes Craig Goldthorp. The impressive quartet have shone as ’Well have started 2019 with a pair of vital 1-0 league victories – over Hibs at home last Wednesday night and in Saturday’s success at Dundee. Spaniard Gorrin (25) told the Times and Speaker: “The future looks bright. We have a lot of good players. “There are a lot more in the reserve team as well that are pushing us hard and it is good. “It was a very physical game against Dundee. “We were very happy that we came away with the three points. “We are looking upwards towards the top six now. I think it is a great effort from all the boys. Motherwell, ninth in the latest Scottish Premiership standings, are now well clear of the relegation zone and looking above them in the table rather than glancing nervously over their shoulders. If the Steelmen are to fulfil their ambition of finishing at least seventh this season, then this Saturday’s home game against Livingston – who are just three points better off – looks to be a crucial one. Gorrin added: “We realise in Scottish football that every game is a tough game. “We are expecting a battle against Livingston and we will be trying to get the maximum points. Some sneering, ignorant English pundits would have everyone believe that the Scottish Premiership is not up to scratch. But, with quality teams like Celtic, Rangers, Kilmarnock and Aberdeen battling it out at the top of the division in what has been an exhilarating campaign so far, Gorrin is having none of it. Indeed, the Spanish ace revealed that he struggled to adapt to the pace, power and quality he was up against during his first few months with the Steelmen. Gorrin added: “The Scottish league is very physical, very intense and it took me a lot of time to adapt. “The league is very tight at the top and any team can beat each other. In a welcome boost to Fir Park followers, Tenerife-born Gorrin, who joined Motherwell last June from a Romanian side, told the Times and Speaker that he is keen to stay with the Steelmen after the expiry of his current contract this summer. “I’m happy you know,” he added. The Spaniard has a definite admirer in Motherwell manager Stephen Robinson, who said after last weekend’s win in the City of Discovery that Gorrin’s fine display had been highly effective in helping to negate Dundee’s threat. He said: “We’re not the biggest team, contrary to what people think. “We were really disciplined in our defending today. “I thought the three midfielders, Alex Gorrin in particular was excellent again. “He was building and giving us that foothold in the game that sometimes we haven’t had previously. “I didn’t feel that we were under any great threat. “I thought we were in total control. “I thought they didn’t create any clear cut chances. “There was one where Deacon cut inside – very good player – you’re going to get that when you come away to Dens. “There are going to be one or two chances. “But on the break, probably we could have had better decisions and finished the game off. When told that gaffer Robbo had singled him out for special praise, Gorrin admitted that he was flattered by the comments. Gorrin said: “I’m very happy obviously.